Alright, before we make some sawdust, we need to get everything ready and make sure we’ll have all the needed tools and supplies to finish this project. Most tools listed here will be common to most woodworkers. If you do not have a specific tool, or you are not a woodworker, you may be able to fudge in a few places, but I would be sure to check the full building pages on each item to see if you will be able to MacGyver something or not. Some of the woods may require a little bit of extra searching – this isn’t like making an oak dresser! Beyond the basic set of tools and woodworking supplies, only a few specialized items are needed. I would say the only two specialized ones that are an absolute necessity are the zither pins and a tuning wrench to fit them. 3/16″ brad-point drill bit – preferably high quality for accuracy, for drilling the holes for the zither pins. Bandsaw or tablesaw – to cut the 10° miter for the frame, and also to generally rip pieces of wood to the correct size. Drill press – not an absolute necessity, but will definitely help. For drilling the holes for the zither pins. High-speed rotary tool (Dremel, B&D wizard, etc.) with cut-off wheel – for quickly notching the tops of the hitch pins, though a hand-file may also be used. Scrollsaw, jigsaw, or 1 3/8″ holesaw – for cutting either a triangular or circular shaped soundhole in the top of the psaltery; an exacto knife or similar implement may be used to cut the soundhole manually. Clamps – various clamps are used in conjunction with jigs to help glue things together as sturdily as possible. I regularly use c-clamps, spring clamps, and bar clamps – along with some shop-made ones as well. Metric and Imperial rulers – most measurements are given in inches, but some of the more precise measurements dealing with the pin layout are given in millimeters (mm). Needle-nose pliers, wire cutters, locking pliers – used in stringing the psaltery. Wood glue – more on the specific types that are most fitting for musical instruments on the glues page, which is mentioned throughout the building process. Wood finish – more on the specific types that are most fitting for musical instruments on the varnishing page. Sandpaper, various grits – used throughout the construction process; hardly seems necessary to mention, but even though sandpaper does a thankless job, not all sandpapers are created equal. Listed is the approximate dimensions of each piece in rough form; more details as to where to find each piece are given on their respective building pages. In all cases, care should be taken to ensure that the wood is both sound and dry. 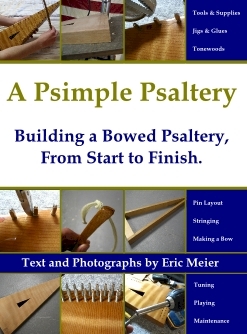 By hardware, I basically mean anything that is part of the psaltery that isn’t wood! 50 zither pins – half will be the tuning pins, half will be hitch pins; see the sub-section in the stringing page. ~50 ft. of music wire – a total of 25 strings are strung between their respective hitch and tuning pins; see the sub-section in stringing page. 1/8″ diameter metal/plastic rod, approximately 7 1/4″ long – this will be the saddle, which will protect the bridge from all the strings. This is basically everything that is not actually a part of the psaltery, but is still necessary to play or tune it. Tuning wrench – used to insert all the zither pins and to tune the strings; see the sub-sections within the stringing and tuning pages. Bow and rosin – see the section on the bow. Digital tuner (optional) – see the sub-section in the tuning page.